UPDATE 2/7/19: IN STOCK NOW! 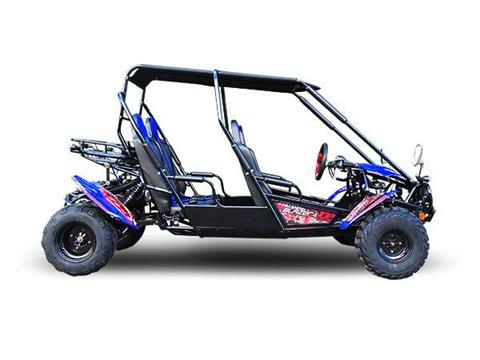 Get ready to hit the trails in this Blazer4 150X kart! 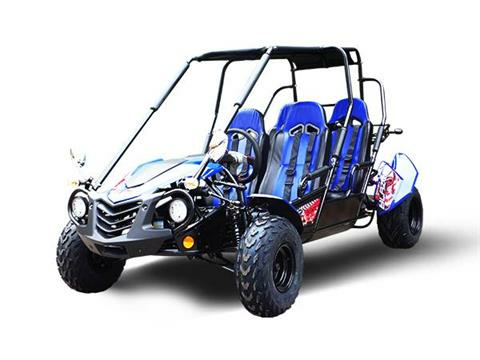 The TrailMaster Blazer4 150X is the perfect family go-kart that is outfitted with 4 seats. This stylish go kart is made of heavy duty framing that has a net weight of 500 lbs and has a max rider capacity of 661 lbs! This kart is outfitted with a 150cc engine and enhanced gearing with full suspension all the way around. After packing this kart with four grown men, we went on a test run and this TrailMaster Blazer4 150X ran as smooth as silk. It had no problem climbing us up over hills and through rough terrain. The gas pedal to seat back is adjustable from 34" to 39", fitting a driver up to 5'8" in height. Front seat to rear seat distance is 28", fitting a passenger up to 6' in height. ***While Trailmaster does not provide a labor warranty, Mooney Motorsports does provide a 90 day labor warranty for manufacturer defects on karts that are purchased from us.